Buddhism began in India 2,500 years ago, and after developing there for over 1,000 years, it was then brought across the Himalayas to Tibet, where it became an inextricable part of the culture, flourishing for centuries. After the Chinese Communist occupation of Tibet in 1949, Tibetan Buddhism began to emerge from its mountainous sanctuary and its techniques and philosophy have since spread throughout the world. Tibetan Buddhism teaches us that each and every person has the ability to reach their highest potential and that this is achieved through working with the mind. Through cultivating the wish to benefit and not harm others, we can transform thoughts and actions, improving our life and creating a better world. 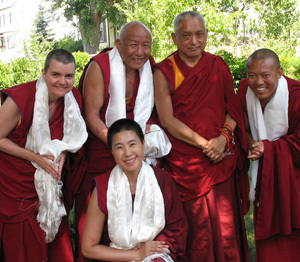 This is accomplished through listening to teachings, study, contemplation and meditation. We investigate the way things are, identify obstructions in our lives, and accustom our minds to new and more effective habits. For more information about Tibetan Buddhism, go to Frequently Asked Questions on the FPMT website.